Lost chances? That is not what you want to be talking about at the end of the season, but that might be what happened at Saint Cloud this last weekend for UMD. The Huskies were very beatable both nights, but each game brought challenges that the Bulldogs could not overcome. Friday’s 3-3 tie was hard to get the flow because of the number, and lopsided number, of power-plays. “It was a good first 20 minutes. The next 40 there wasn’t a lot of 5 on 5 hockey.” With 10 power-plays for SCSU and 5 for UMD with five straight power-plays for the Huskies, it was difficult to flow within the game. 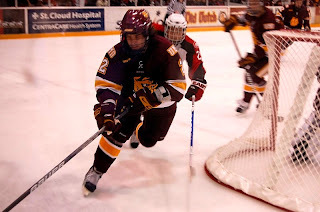 For all that happened, UMD never trailed in the game and had good goalie play from Hjelle. It shows the mettle of the Bulldogs. Saturday’s game, a new night with a new outcome, and new concerns. 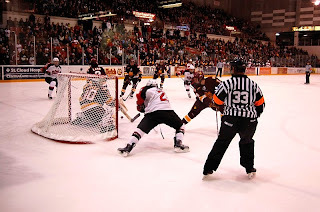 Again special teams was the story of the game with UMD scoring both their goals in a 4-2 loss on the power-play. SCSU also scored a power-play tally, but the real back-breaker came in the second period with two short handed goals. It seemed to take the Bulldogs right out of the second period. To their credit, UMD came out in the third and played hard and looked very cohesive at times, but only managed one goal. Hjelle again played well at through most of the game, but was the victim of the short handed tallies. After the second period, it was not a surprise to spell Hjelle with Reiter. It was a good WCHA debut for Reiter as he played well, but only faced four shots. It was the first road assignment for the season for UMD and it showed that the team must consistently play full games, not just parts. Additionally, I think that this is a wake-up call that playing road WCHA games is never easy no matter the caliber of the opponent. The next series for the Bulldogs of UMD will be Clarkson back at the friendly confines of the DECC.